One of the greatest things about Christmas is all the lights that seem to illuminate the night’s sky. Things just seem more festive when they are light up. From Christmas tree lights to light decorations, they all bring joy into our hearts. Why not have that special feeling all year round? Christmas tree lights have a lot of uses that you can incorporate into your decoration, outside the holiday season. If you are not sure what types of lights will suits your needs and tastes, click here to check out some options that may suit your budget and style. For example, rope lights can come in a large variety of colors and are great for decorating your deck, hot tub or boat. You can even get lights with blinking or chasing functions. Some great and imaginative lighting ideas have been features in shows on HGTV and in many magazines. Icicle lights are another popular option, and they do not have to come in the standard white color, why not try something like purple, or green. Although they look great hanging from the house they are also quite lovely as a garland around your deck. A great alternative to traditional Christmas tree lights are LED lights, they produce light in a slightly different way so they do not produce much heat (which could lead to fires) or waste electricity. For many people LED lights are the safer and frugal alternative to traditional lighting. Many people also find the colors to be much more intense than in traditional Christmas tree lights, which can lead to some imaginative creations. 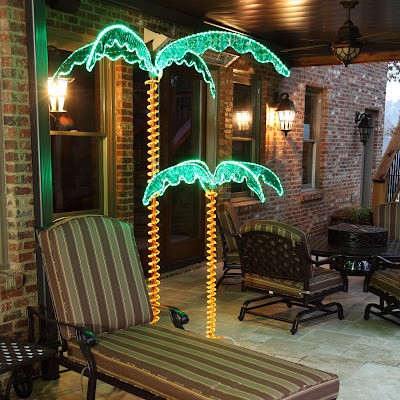 This summer as you ready your back yard for late night BBQ and splashes in the pool, try using these lights to create a mystical atmosphere which will create special memories outside the holiday season.